RETIRE.FUND: Miners with huge lithium and REE deposits !Could be takeover targets in 2010? Miners with huge lithium and REE deposits ! Could be takeover targets in 2010? Oil circa 1909, plastics circa 1955 and Lithium in 2010. Lithium will store our power generated from wind and solar. 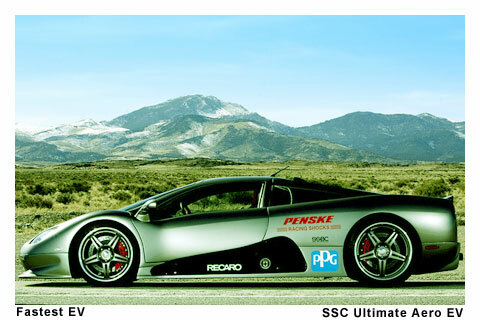 It will power electric vehicles and improve hybrid plug-in vehicles. It is starting to power the mobile web (smart phones, iphones, ipads, note books and laptops). Every battery used for electric vehicles will require 8 pounds of lithium! We are now invested in six lithium mining stocks. Here are some of them, and the reasons why! From Ford to Toyota, GM to Honda, and Nissan to BYD , from China to Chile and everywhere in between, auto companies are searching the globe and scrambling to secure their future supply of this commodity as the electric car is about to re-emerge after a 100 year hiatus. Lithium is used in lithium-ion batteries, (and many new forms of Lithium batteries such as Lithium air, Lithium sulfur etc) glass ceramics, greases, steel, nuclear energy and pharmaceuticals, however, it is the advent of Lithium use as the best material for energy storage in batteries made for the Hybrid and electric vehicle market, that is causing one of the big bull markets of this decade. From Buses to cars and trucks, and every type of vehicle in between including vehicles such as fork lifts, ATV's, motorized bicycles (as in the billion or so made in China and India) skidoo's, seadoos, and everything else that moves, companies are building better electric batteries for these vehicles, and the overwhelming winner of the commodity race is, you guessed it, LITHIUM!! Bu ying into a good Lithium play today would be like investing in oil at the turn of the 20th century, or plastics in the 1950's. It will have that much of an impact as the electric car and hybrid plug-ins become more and more common. 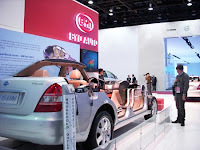 The explosion in batteries using Lithium Ion technology, Lithium air technology, lithium sulfur or any number of other Lithium based materials currently being researched and produced is occurring so fast, that fortunes will be made, and indead, are already being made. Scientists, technicians, engineers and lab rats all over the world, are developing lithium energy storage products at this writing. Lithium carbonate is the best element for storing electricity, period. When compared to current technology such as nickel metal hydride batteries, Lithium is twice as light, produces 3 times the power and keeps it's charge up to 5 times longer. Lithium won't just be used for electric vehicles, hybrids, cellphones and laptops including tablet computers, but also on a larger scale, for wind farms and solar farms where energy storage is absolutely crucial to the future of electrical grid technology. China, recently announced it will stop shipping Lithium and rare earth enements (REE's) to other countries. China sees an opportunity to try and corner the Lithium market while America and Europe are still fending off financial problems and to this end, it has been trying to butter up the left wing government in Bolivia which may hold 50% of the Lithium deposits on the planet. Problem is, Bolivia is a quagmire of political problems for anyone trying to enter the Lithium market there as the president is not receptive to international companies. He wants to develop Bolivia's Lithium deposits "in country". another problem is that this Lithium deposit, while very large, will be expensive to develop because of the large amounts of magnesium and other compounds in the brine. Other locations for Lithium mining are in hard rock formations(Canada-Quebec), clay formations (Nevada) and in Salars or salt Lakes. 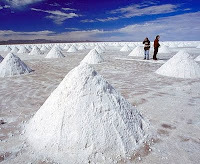 (Besides the big deposits in Bolivia, Chile (which currently supplies 60% of the worlds Lithium), as well as Argentina) It is the extraction of Lithium and Potash from Salars that is the easiest, and cheapest way to mine this very "in-demand" resource. Toda y, 60% of all Lithium is produced in the country of Chile! Chile is really the epicenter of the Lithium boom notwithstanding Bolivia and Argentina, the two other countries that share the Puna Plateau. The Salar flats of the Andes on the Puna Plateau, contain millions of tons of Lithium carbonate totaling 84% of the worlds known reserves. This Lithium is also the easiest, and cheapest Lithium to extract, as the sun does most of the work, in this, the driest area on the planet. According to one of the foremost Lithium experts, R. Keith Evans, "Because Mother Nature does most of the work in producing lithium carbonate in this region, it is the greenest source of lithium we know of". Any other source requires significantly more energy for processing, thus increasing the price." (read hard rock sources) Add to that the fact that Chile recently elected a conservative government that is very friendly to the mining community, and you have the making of a full blown, 5 alarm, bull rush into the Chilean Salar flats by a number of Juniors. Nevada also has similar, but smaller, lithium resources. Canadian Juniors are leading the way in this boom and they offer the best investment "bang for your buck" so to speak, as investors wake up to the fact that Lithium will power the future of most automobiles. Currently, the top producer of Lithium from the Chilean "Puna Plateau" is Sociedad Quimica y Minera (SQM). To date, their Lithium production has been a by product of the potash which they mine there, and their stock price is already through the roof. In 2010 they are increasing their production of Lithium to meet increased demand worldwide. Here are our picks in the Lithium junior miner sector, in order, based on the size of deposits identified, and the purity of the Lithium carbonate to be mined. 1.Salares Lithium (LIT-TSX) owns over 117,000 hectares (288,990 acres approx) in the Atacama region of Chile, encompassing 7 Salars (brine lakes). It is one of the best, pure play Lithium ventures anywhere today with a depth of resource between 170 meters and 300 meters in a region that already produces 50% of the worlds current lithium supply. In fact, SQM, the largest producer of lithium in the world today, may actually be interested in some or all of Salares Lithiums concessions due to their close proximity and the purity of the resource. 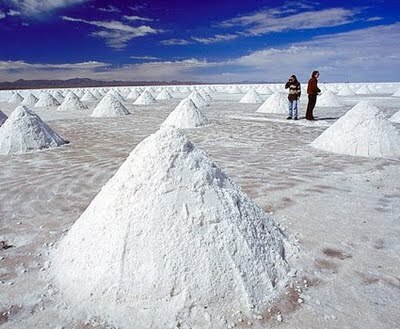 Salares Lithium wholly owns 100% of 5 of those Salars, which is unique in the industry and very important in South American mining. Many others "share" deposits on the same properties. Salares now has a giant Lithium footprint, as large as anyone on the planet (read the article: Size matters ) They also have a very focused management team and institutional investors are in on this play.Now SQM may be interested. Analyst opinions on Salares Lithium! 3. The biggest "sleeper" in the space is TNR Gold Corp (TNR-TSX) which is currently flying under the radar of most investors. TNR Owns 16 gold, copper, Lithium, and REE properties in Nevada, Canada, Argentina and Ireland. More importantly, TNR "owns 100% of International Lithium Corp" (ILC) which it will spin off next month in an IPO. Barrick Gold, Pinetree Capital, Tocqueville Fund, Solitario, and NovaGold. At this writing, all of these stocks can be had for under $1 per share. There is truly a "fire sale" on these market go-getters who have staked their claim in the Lithium rush of this decade and stand to reap huge rewards for their efforts. 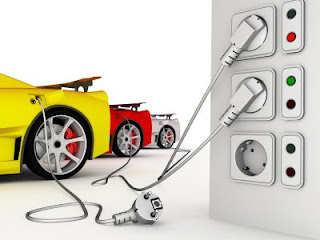 You can invest in the battery companies, (who are battling it out in the technology department) the electric car companies, or the mobile web device makers like Apple, and they are indeed good bets. However, they all need the raw product, and that is Lithium, specifically it is lithium carbonate. The companies listed above with properties in Chile and Nevada, are in the drivers seat as these deposits are already known, are enormous, and will be processed at the lowest cost, because the sun provide most of the energy needed for production, in the driest, most arid places on earth. The lithium boom will last for at least the next 10 years. As many investors make their fortunes from this 21st century boom, I hope that you are one of them. I certainly intend on being one. May 18th Nissan reveals new Leaf electric car will be mass produced in 2010. Rick Mills of "Aheadoftheherd.com on Stockhouse. The Lithium boom Electric Vehicles and the Mobile Web. Lithium Sulfur Battery will keep plane aloft for 5 years! Posted by H. Pelham at 8:54 p.m.